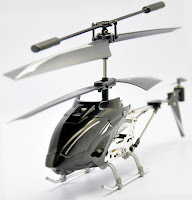 Article first published as Gadget Review: Lightspeed iHelicopter on Blogcritics. I'm always intrigued by some of the displays and product demonstrations that I come across in indoor shopping malls. You know, the boomerangs, the magnetic bracelets and those pesky remote controlled helicopters. Well, the iHelicopter from Lightspeed fits right into this category of amazement, and I was privy to try one out this holiday season. The iHelicopter is an actual working machine that can fly throughout your house or possibly outdoors on a calm day all while being controlled from an iPhone, iPad, or Android mobile device. Prior to takeoff, there are a few steps that need attention, and do note that they take a bit of time, so don't think that your gift recipient will be flying right out of the box. Namely, preparation comes in the form of charging not just the helicopter, but also the signal remote that attaches to your mobile device. I needed to wait a good 30-40 minutes for each before I was flying. Granted, you could probably get by on a shorter charge, but I wanted the full 8+ minutes of fly time that was quoted on a full charge. 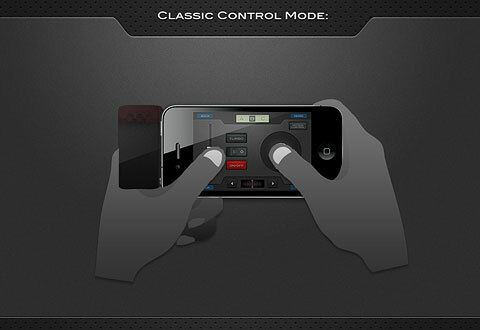 As the chopper was charging, I downloaded and installed the "Copter Controller" free app on my Droid X. 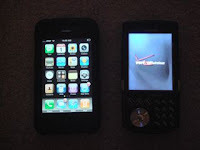 When both the helicopter and the receiver were fully charged, I turned on the helicopter, attached the receiver to my phone, and opened the app. There were a few buttons on screen, and after experimenting a bit (the included instructions actually were helpful, but I wanted to see if I could figure it out without them), I saw flashing lights on my chopper and a blue light on my receiver. Taking these to be good signs, I went ahead and practiced a few takeoffs and landings as recommended by the manual. Back to the mall, you always wonder whether it's the skill of the salesperson that makes it look so easy to control a remote controlled helicopter. And you wonder whether it would be worth the money to purchase and try later on your own. For about $50 US, the iHelicopter is a reasonably priced device that can offer entertainment for a wide variety of ages. Perhaps paired with another helicopter or two, simulated missions or flight shows could be had in your basement or backyard. For international customers, an ihelicopter can be purchased from i-helicopters.net. Paramountzone.com also has many other cool gifts for men on their website.